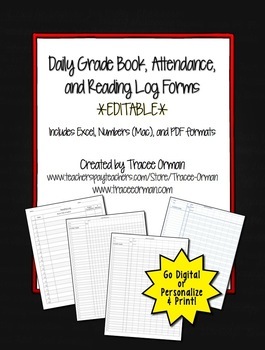 Daily Grade Book or Record Book, Attendance Record, and Reading Log Pages that you can customize! 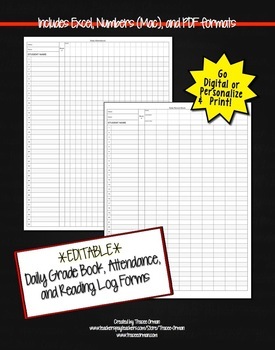 These ARE included in: Teacher Binder Jumbo Pack: Gradebook, Forms, Sub Plans, Lesson Plans, Calendar, and More! The grade book form includes a space on top for the date, assignment, and points possible for each column. In the Excel & Numbers docs you can fully edit all forms, inserting student names and creating formulas for averages, etc. These are also excellent one-pagers to leave for substitute teachers, rather than leaving your entire grade/record book with them. I like to have a sub folder available with class lists & these make it easy to just print off & keep in the folder. All are included in my Teacher Binder Jumbo Pack: Gradebook, Forms, Sub Plans, Lesson Plans, Calendar, and More!